Boxshot features a large selection of customizable shapes: software boxes; hardbound and paperback books; magazines; CD, DVD, and Blu-ray boxes; cards, cans, mugs; bags; and much more. Almost all the shapes are customizable so you can adjust them for your design. If you need more shapes, just load them! Boxshot supports loading FBX, 3DS, and Collada (DAE) files to use in scenes. Boxshot can resize shapes according to your graphics. You don't need to adjust your images for our shapes—Boxshot adjusts the shapes for you! Choose from more than 50 customizable shapes to build your scene. Boxes, books, mugs, CDs, DVDs, cans and much more. The built-in raytracing engine makes your renderings look so unbelievably realistic, your customers may think that it's a photo. Our advanced lighting system, based on a raytracing renderer, creates realistic soft shadows and amazing light effects. More than 20 parameters at your fingertips, so you can create exactly what you need. Or choose a material from the built-in library. The user interface helps you to concentrate on the creative side of your work. You will feel at home within minutes. Use your mouse to move, rotate and scale objects in the scene. Drag and drop shapes, materials and images. Boxshot is as intuitive as possible. Our camera manipulation tools guarantee that you will never get lost in the scene and can always render exactly what you need. Post your rendering online? Check. Export to a popular 3D format for additional processing? Check. 3D PDF for customers? Yep, one more check. You can adjust most of the shapes to fit your graphics and your project. Control everything with intuitive sliders, or let Boxshot do the job for you. Save cool camera positions and views to use again later. Snapshots help frame the scene the way you want people to see it. Group the objects the way you want; rearrange them if you like. Boxshot features a professional scene tree in case you need to do really complex stuff. It doesn't matter how many shapes we provide: there is always one missing. No problem! Drop a shape into the scene and Boxshot will load it for you. Create amazing fly-around animations using the built-in sequence rendering tool. Convert sequences to videos, or create pseudo-3D objects for your website. Boxshot features the latest iPad and iPhone shapes, so if you need a cool screenshot of your app on a device – you're at the right place! Boxshot features a crystal-clear, hardware-accelerated editing mode that makes the most of your graphics card to give you the best scene editing experience possible. Boxshot loads high definition range images for use as environment and lighting. This makes your images very realistic. Boxshot loads PSD files, so you don't need to export to any other format while you're editing. Boxshot supports complex rendering scenarios by using jobs. Create a job with a few shots of the scene and render it later, when you have time. Almost every shape in Boxshot is scriptable, so you can control the whole scene with just a few lines of code. Scripting combined with jobs gives amazing results. Rendering may take a long time, so why not put the shape in the queue and do something else? Boxshot can render all queued shapes while you sleep. Boxshot supports resolutions up to 8000x8000 when running in 64 bit mode. That is about A4 size at 300 dpi! Boxshot lets you put any flat object in a stack: books, boxes, disc cases and so on. Mix them together to create a beautiful scene. Boxshot is 8 years old and still growing. Request features, provide feedback and get free upgrades. It's really cool! Why endure a photo session if you can do everything in Boxshot? Use our professional ray-tracing engine that creates production-quality, realistic images of your shapes. Boxshot helps non-professional users create amazing images. 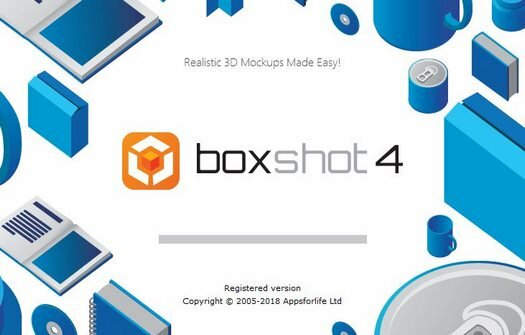 Boxshot helps you focus on your design by providing a cleaner and more intuitive user interface than any other 3D application. Boxshot features 50+ shapes, so it probably already has the shape you want to render. If not, you can always load your own 3D shapes and render them along with the built-in ones. Requirements: Windows 7, Windows 8, Windows 10 (64-bit).